A BBC report confirms China’s extensive land reclamation projects in the South China Sea. What does Beijing gain? Along the new coastline I can see construction crews building a sea wall. There are cement-pumping trucks, cranes, large steel pipes, and the flash of welding torches. 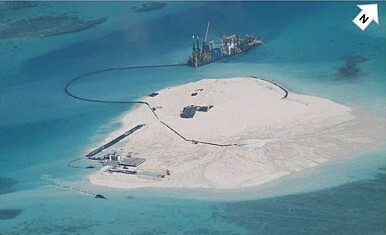 According to the report, China “is building substantial new islands on five different reefs.” Wingfield-Hayes notes that no one is certain what China plans to do with the new islands. The Philippine government has expressed concerns that one, Johnson South Reef, will be the home to a new South China Sea airbase. However, it’s equally possible that China plans to install civilian populations on the new islands to bolster its sovereignty claims. China, the Philippines, and Vietnam all maintain small civilian outposts in the South China Sea as a way of legitimizing their claims (and deterring military actions by other claimants). It’s also possible that building the “islands” is an end unto itself. Under the U.N. Convention on the Law of the Sea, submerged features (such as shoals) cannot be claimed by any party. The Philippines’ request for arbitration on the South China Sea disputes is in part based on this fact; Manila requested clarification as to whether or not China (or any other state) can claim submerged or partially-submerged features under UNCLOS. In addition, Part VII of UNCLOS specifies that “Rocks which cannot sustain human habitation or economic life of their own shall have no exclusive economic zone or continental shelf.” Under this provision, even if China were to gain control over the Spratlys, its control would be limited to the 12 nautical mile territorial waters, without an accompanying exclusive economic zone. If, however, China can create “islands” on top of previously submerged features and create conditions for these new islands to “sustain human habitation,” then China would have strongly bolstered its claims to the South China Sea. This is exactly what the Philippines objects to. In an interview for the BBC report, Department of Foreign Affairs spokesman Charles Jose called China’s claims in the South China Sea “outrageous,” “excessive,” and “without basis under international law.” He also accused China of trying to change the status quo to strengthen its claims before the arbitration court hands down its ruling on the Philippines’ case. If there is anything to be gleaned from Hua’s response, it is that China does expect to have people living and working on the islands. Whether these people will be civilians or whether the newly-constructed islands will house military bases remains to be seen.